This recipe is borrowed from one of our favourite cookbooks, Veg Everyday by Hugh Fearnley-Whittingstall of River Cottage fame. Summit Organics is located in north-eastern New South Wales, Australia. Our farm is thirty kilometres west of the town of Murwillumbah, and eight kilometres beyond the historic village of Tyalgum which is known locally as the ‘Heart of the Caldera.’ In this sub-tropical region of NSW’s Northern Rivers, Mount Warning-Wollumbin and its surrounding ‘caldera’ are remnants of the long-extinct and enormous Tweed Volcano. 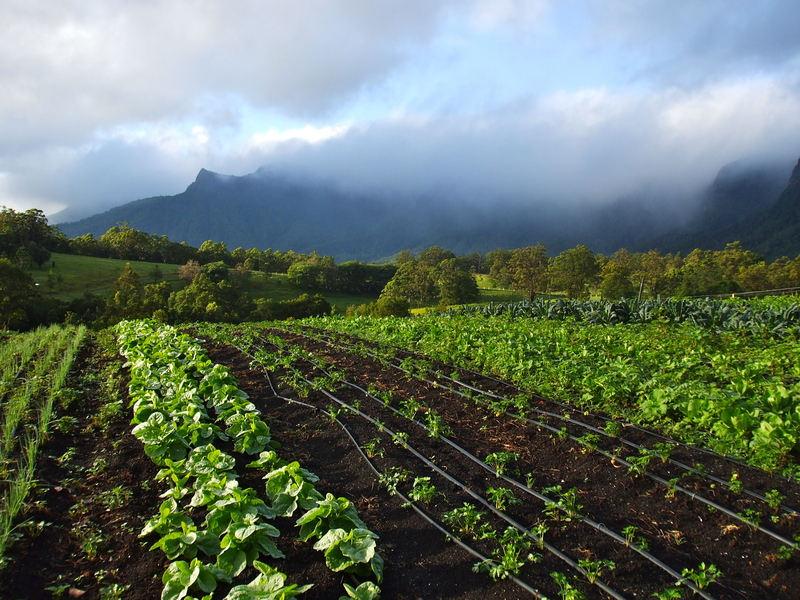 Summit Organics is owned by Rod and Tania Bruin, and their farm comprises 128 hectares (338 acres). This property is located right next to the World Heritage-listed Border Ranges National Park and commands absolutely stunning views. The vegetable production area is an intensive market garden and utilises approximately 2.5 hectares (six acres). The farm is certified with Australian Certified Organic (ACO Producer No. 2199), is subject to the Australian Organic Standards, and is audited annually. We produce more than fifty different vegetable and herb crops in a year. They are marketed through New Brighton Farmers’ Market (Tuesdays 8.00 – 11.0am), Mullumbimby Farmers’ Market (Fridays 8.00 – 11.00am) and the Gold Coast Organic Farmers Market Sundays (6.30 – 11.30am at Miami State High School). Summit Organics originally started out as Summit Coffee Plantations when we were producers of the first ‘Certified Organic’ coffee to be grown and processed in Australia. Approximately 15 years ago we decided to focus on organic vegetables. Our first vegetable crop was sweet potatoes which we sold at the Lismore Organic Market. This first, small taste of success gave us the confidence to gradually increase the range of crops. The irrigation water used by Summit Organics comes from two spring-fed dams and is gravity-fed to the production area, so no pumping is needed. The dams are also filled by rainwater falling directly onto the Border Ranges, a pristine environment which is largely unexplored by humans. We use flexible irrigation pipe to drip-feed water directly to the plants. Drip/trickle irrigation minimises water consumption as drip feeding targets only the plants that require water. The irrigation pipe is re-used many times on the farm, drastically cutting down our use of plastics. Summit Organics are in the process of improving soil condition through the regular application of certified organic compost. This is produced by Lismore City Council from council-collected green waste, and arrives by ‘truck and dog’ (i.e. truck + trailer) loads of around 36 cubic metres. Summit Organics are actively involved in education and training. We regularly host Farm Walks on the property, teaching interested people about organic farming and soil care. Regular attendees include: Organic Agriculture students from TAFE; Permaculture students; and of course many of our market customers. Rod continues to be invited to speak at various organic forums, film nights and related activities held throughout the region. He has been awarded life-membership of the local Soil Care group in recognition of his efforts. Summit Organics has an ongoing involvement with TROPO, the Tweed Richmond Organic Producers Organisation: go to http://www.tropo.org.au/. There is a superb video of our May 2010 Farm Walk which can be viewed at www.forgreenies.com or on You Tube. Rod and Tania also feature in the excellent new documentary, ‘The Worm is Turning’ : go to https://vimeo.com/ondemand/thewormisturning. We aim to provide greater security and sustainability to the local food supply as well as increased production with minimal ecological footprint. We continually trial new crops, crop covers and growing systems. Most important of all is the promotion of healthy soil and crops through excellent organic farming practices. In a nutshell, our philosophy is: healthy soil—healthy plants—healthy people—and of course, a healthier planet! Thanks for the mention guys! Love the new website too! Long overdue thanks Kat. We’re now (finally!!!) just starting to catch up with some of the website stuff as Michelle and Rachel moved away. Cheers, Peter B. Love the new website! So clear, fresh and informative without being boring 🙂 Still wish you guys did deliveries up our end! Hey Rod,Tanya & the Summit team, Love your work! Leo. My friend took some AMAZING pics of your veg today and one of me with your sign in the background. If you like I can send you the images? If so send me your email address. So grateful for your care this morning. Hope I have spelt your name correctly. Omg Tania! You were so right! That watermelon IS the “bomb”. Great to see me old mates doing so well. Always knew you’d do great. Hey Rod can Tan still out pick ya???? Simply beautiful to see people passionate about healthy, sustainable ways. I wonder if there is a facebook avenue you could take to promote and encourage and enrich others. I’m seeking Employment inquiring if you have any positions? Thank you for your work enquiry. There are no positions available just at present, I’m sorry. If you like, you could email your contact details to us — info@summitorganics.com — so that we could get in touch if we needed your help down the track. Hey Tania, its Mark. I went to the markets the other Friday but didn’t see you. I will be back on the gold coast next week, and would love to find out from you how to grow my own sorrel. If I dont make it in time for the Sunday markets at Miami, will be there on Friday. Hope your well. Was great catching up with you last weekend at the Miami Market and as always beautiful Curly Parsley. Your produce is just so vibrant, fresh, bright just stunning. Will keep in touch. Oh I nearly forgot, let me know how the Skin Relief goes. Do you sell compost? I have heard there is someone in Tyalgum who does. The short answer is ‘not usually.’ We buy large compost primarily from Lismore City Council and have it shipped here by truck and trailer. If you are wanting only a small amount we might be able to help you. I’d suggest that you email us your contact phone number. Our email is — info@summitorganics.com — Hope this helps.